The Home Automation System can automate the entire home. 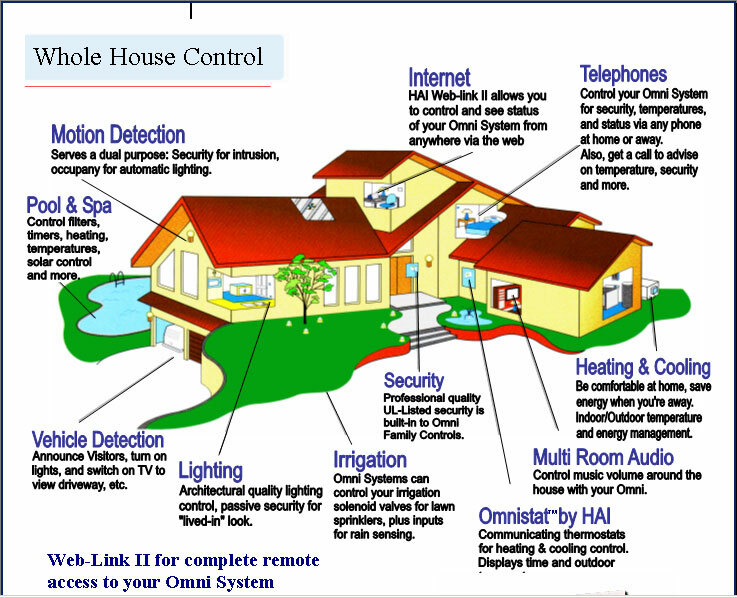 The system has the capability to interface with and remotely control the HVAC, Lighting, Vehicle Detection, Fire Alarm and Security Systems. It also integrates with your Telephones, Intercom and Local Area Network through your enhanced Structured Wiring System. The Home Automation System Control can be programmed by the time of day, date as well as based on changes to the outside temperature or motion detection. The system can be programmed for an away mode that will arm your security system and lower or raise the temperature within your home and do the opposite when you return home. The Functions can also be changed over the phone or through your Internet service, even on your "iPAQ pocket pc". The Home Automation System along with the Structured Wiring Center and other compatible systems allows you to sit down with the family, press one button and have the television turn on, the DVD player start playing, the lights dim down and set the volume of the home theater system to the perfect level.